Well, just for fun I decided I would go on a status run with the goal to become a Qantas Platinum frequent flyer. To do this I would be utilising the services of American Airlines with discounted first class fares. 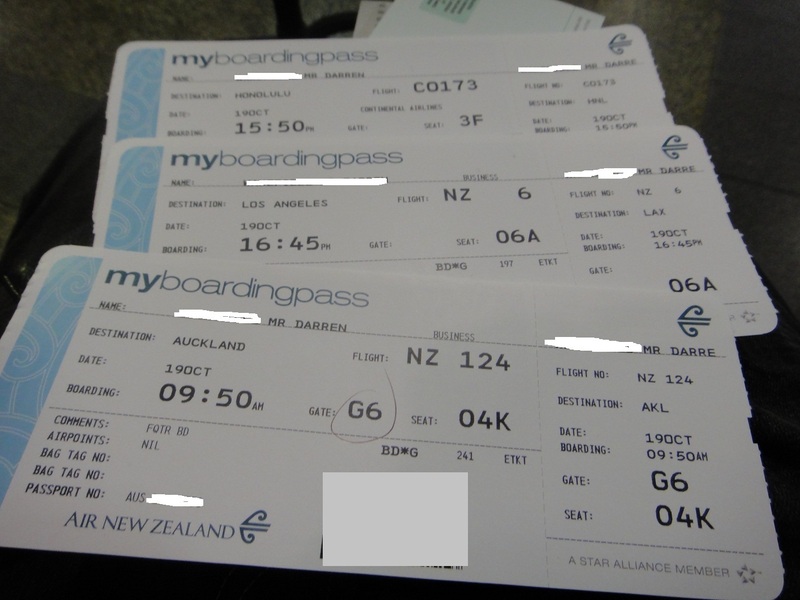 I would be starting off in Honolulu, but to get there from Melbourne I decided to travel in style and use some Star Alliance frequent flyer points and go Air New Zealand business class via Auckland and Los Angeles and then Continental to Honolulu. A friend was nice enough to pick me up and take me to the airport, so it wasn't long before I was at the airport and finding my way to the Air New Zealand check-in desks. When I arrived they were still setting up, I was a little early... but only by about 10 minutes. I checked my phone to see if everything was running on schedule. I use Tripit Pro on my HTC Desire handset to monitor my trip and it showed all flights on schedule at this stage. I highly recommend this program! Check-In was quick and easy and the check-in agent printed off my two onward boarding passes, including the Continental Airlines flight. She was quite surprised at my routing for today but had a laugh when I explained I am the kind of person who will deliberately chooses the longest way to get somewhere on a plane. Boarding passes in hand it was off to passport control, security, then onwards to the Air New Zealand Koru Club for a spot of breakfast. They usually have a good food selection on offer including a hot breakfast. Today I had scrambled eggs, sausage, bacon, toast, bircher muesli and a glass of sparkling wine to go along with it. I was pretty excited to be flying Air New Zealand business class for the first time although I have used their lounge numerous times before when travelling other Star Alliance carriers. There is an interesting staff departures display board in the NZ lounge which shows aircraft registrations and passenger loads. A quick check of the screen shows that I will be flying on ZK-OKG for this flight, and there are 257 passengers in total. After a leisurely breakfast and a few phone calls to friends it was off to the aircraft nice and early, don't want to miss out on that welcome Champagne! As I entered the aircraft I was warmly welcomed by the crew with that fabulous Kiwi accent. I entered the business class cabin and was immediately impressed with the cabin layout and seats. I settled into my seat and started exploring the seat controls, handset etc. Air NZ use the herringbone layout so everybody has aisle access. There is an ottoman which features a seatbelt and makes the seat capable of hosting a 2nd passenger for meals, although it is a little small. The side walls are low enough so that you could actually talk to a fellow passenger whilst sitting. However when you put the seat into sleeping configuration you still have plenty of privacy. It wasn't long before I was offered a welcome drink, Champagne of course. The seat has a limited amount of recline when it is in 'seat' mode. You can recline back and put your feet up onto the ottoman, however to get into bed mode you must stand and press another button at the end of the seat. This is because the entire seat flips over to form a bed connection with the ottoman. It is pure flat and not angled at all. For this short 3.5 hour flight almost all passengers kept their seats in 'seat' mode, kicking back with a movie and enjoying the great food and wine. Boarding was soon complete and we pushed back and headed to Runway 27, the shorter of Melbourne's two runways. We took off to the west before making a couple of left turns and tracking over the eastern suburbs of Melbourne and then western Victoria. I went for a visit to inspect the lavatory, and found it was well equipped with Pacifica Organics products, a New Zealand brand. As we were reaching top of climb the crew commenced service. The large dining table slides out of the side wall of the seat and is released with the press of a button. The crew came around with table cloths followed by drinks and some 'Cassava Crisps', which were very nice. I had a vodka and orange juice, the vodka is New Zealand made too (42 Below). The food was absolutely delicious, probably one of the best meals I've had in the sky and the wine was just great. The ice cream was divine! My wine was never allowed to be empty and service was impeccable and friendly at all times. I was really impressed with Air New Zealand. After dinner tea and coffee was offered along with a mint chocolate. All too quickly we commenced our descent into Auckland. I was so content in my seat I wished it would go on forever, but with another 12 hour flight to Los Angeles to come after this I still had something to look forward to. My first experience with Air New Zealand business class was an outstandingly positive one. I actually think I enjoyed it more than Singapore Airlines business class. Next up, my flight to LAX. You know that boarding pass shows a whole bunch of information - including your full name - you may wish to blur that "barcode" out.